Place 2 tablespoons blueberries and 1/4 teaspoon agave nectar in a bowl; mash blueberries to desired consistency. Stir in remaining blueberries. Combine yogurt, vanilla, and 1 teaspoon agave nectar in a bowl. 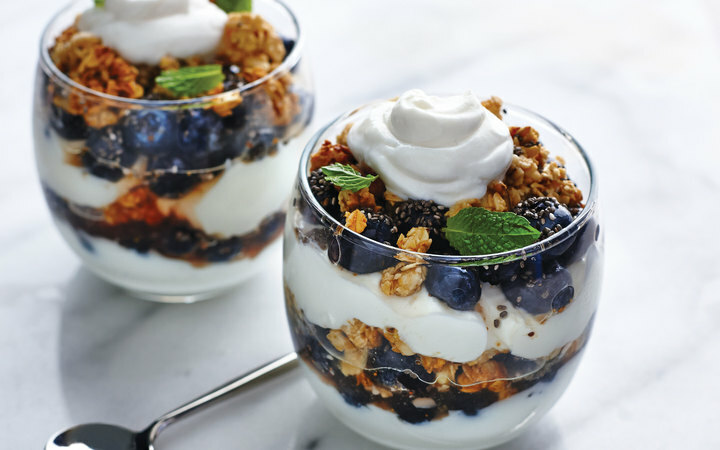 Spoon 3 tablespoons yogurt mixture into each of 2 (8-ounce) glasses. Top with about 2 tablespoons blueberry mixture, about 1 1/2 tablespoons granola, and 1/2 teaspoon chia seeds. Repeat layers once. Top each with 2 tablespoons yogurt mixture, and garnish with mint leaves, if desired.